Hair: Red and very long, reaching to at least her knees. It was divided into five or six sections, each of which made into one thick braid. She also had a narrow band around her head. Life history: Kaslen was a Firstcomer and member of the Circle of Nine. Her function was to be their ship, protecting them through space. Kaslen retained her treeshaping abilities after the Palace's crash, and it was her dream to perfect it and make food aplenty, so it would no longer be necessary to kill. It was also her idea to shape a shelter in the trees above ground. It was while doing this that the branch on which she was sitting broke, causing her to fall down and break her leg. Aerth wasn't able to heal it without the aid of the Palace's power and they went there, which led to a confrontation with Haken. There was never time to heal Kaslen's leg and she remained disabled. 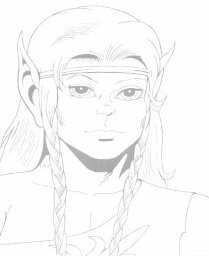 Kaslen's gentle nature, treeshaping abilities and hair colour suggest that she is one of Redlance's ancestors, though nothing has been stated for definite on the matter. It is unknown how she died.